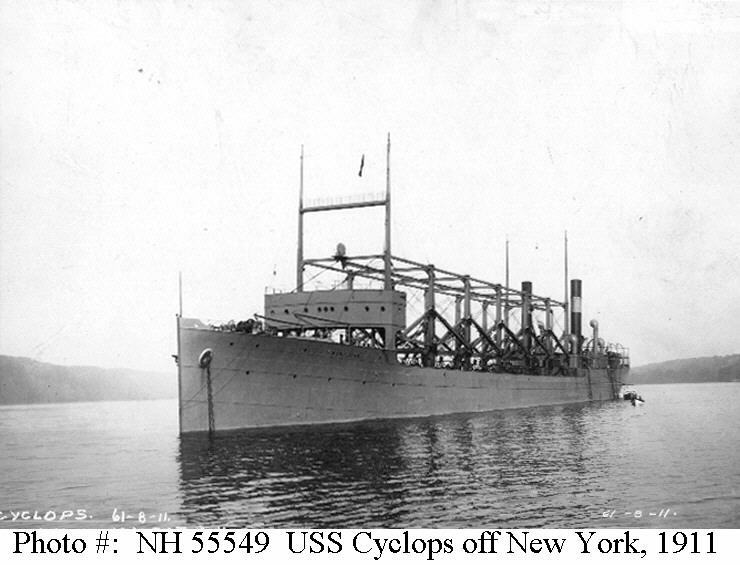 The USS Cyclops was a US Navy Collier (supply ship,) that disappeared in the Bermuda Triangle. It became one of the more famous Bermuda Triangle disappearances for a variety of reasons. Theories range from a crew mutiny since she was carrying three convicted murders from the USS Pittsburgh along with two mutineers, and another 42 men from the Pittsburgh headed home for reassignment. The second major theory is that she sunk under her improperly loaded cargo. And the last major theory is that she was to given over to the Germans. This later theory is backed up by two facts. The Captain, Lieutenant Commander George W. Worley had been born in Germany as Johann Friedrich Georg Wichmann. He had apparently jumped ship in San Francisco in 1878 and immigrated to the United States. He was known to associate with other German Captains before the war. The other possible support for this theory was that one of the ship’s passengers was US Consul General Alfred L.M. Gottschalk. He was of also German ancestry, and extremely pro-German before the war. He’d boarded the Cyclops to head to the United States and enlist. Another strange fact is that she was one of four Proteus class colliers built before WWI, and the first of THREE of the ships to disappear in the Bermuda Triangle. She disappeared during World War I, while the Proteus and Nereus both disappeared in the Bermuda Triangle in 1941 during World War II. The third one built, the USS Jupiter, had been converted into the USS Langley, the US’s first aircraft carrier in 1920. It was also lost, but this time to Japanese air attacks on February 27, 1942. 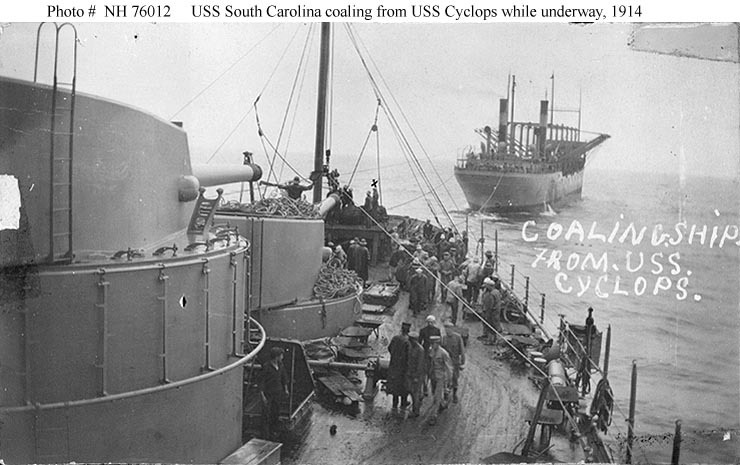 The USS Cyclops experimentally refueling the USS South Carolina in an 1914 while both ships were underway. The Cyclops’ disappearance was originally chalked up to German Submarine activity. But after the war, no evidence was found in German Naval records. But coincidences that made it’s disappearance unusual. A more in depth history of the ship and it’s mysterious disappearance is covered in “The Devil’s Triangle” by Richard Winer, but Bermuda Triangle Central has a great overview of the history. Pictures are courtesy the Department of the Navy – Naval Historical center.